This is Banachek! I think of him as Steve, but don't you! He doesn't like to be called that, maybe because it's not his name? 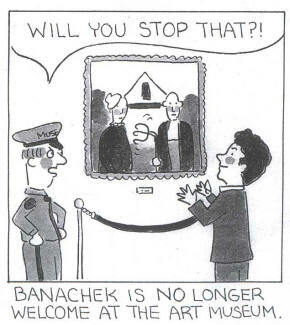 No, I'm just kidding, but he always goes by Banachek. He is really really nice and I like to think this portrait really captures him. He grew up in South Africa and once when he was really young, just starting out, he interviewed Dunninger's wife, Billie, over dinner in a restaurant, and taped the whole thing! I'm insanely curious about Dunninger's wives (see my Chrystal Dunninger Museum), so I just think that's amazing. Listening to the tape is a fabulous experience, it's like you are there listening to this great lady chatting about her life and the great man himself, complete with clinking silverware and glasses and the waiter interrupting! And it's fun how she would dangle some fascinating hint of a story she could tell him, and he would steer the conversation off in an entirely different direction! He says he regrets that now, but I say that's the way it goes when you're interviewing someone, and in a way it makes the interview just as revelatory about who young Banachek was and what mattered to him at that very youthful time in his life. I started out very young as a city newspaper journalist interviewing all sorts of people, so it's really fun hearing someone else in the hot seat! One thing you can really tell from the tape is, Banachek was meant to be a mentalist from the start. Today Banachek is a very famous and busy mentalist who does lots of shows all over the place and on television worldwide and comes up with all sorts of really cool mental effects he puts in books and on film to share with his many admirers around the globe. I know, because some of the effects have ended up in my freezer being tested out when he was working them out with Joe, who is super great friends with him.